Noisy breathing, in particular grunting, whistling or crackles. Often this can be felt through the chest before it can be heard. Gasping or mouth breathing – an extreme symptom where the rat opens its mouth to breath, often accompanied with audible intake of breath noises. General signs of being unwell such as porphyrin staining, fluffy fur, lethargy, weight loss etc. 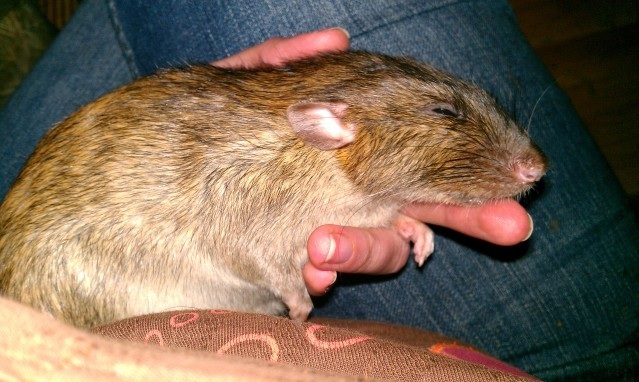 This is the most commonly reported respiratory infection in rats. Myco is a bacterium which is considered endemic in rats. This means that all our rats will carry it as its transferred from mother to baby on birth. Typically only certain strains of lab rats kept in sterile conditions are myco free. This bacterium can cause several different infections, the most common being respiratory issues but it can also cause ear infections and pyrometer. The amount it affects the rats is very much down to the rats innate resistance to it. This is where selection is useful and there are a number of well-bred lines out there that have very little issues with myco. Even a pet shop rat can sometimes be resistant to myco and live a myco free life and yet another can spend its whole life with issues. Myco respiratory infections tend to occur later in life, due to the way the bacteria spreads it is very uncommon in rats under 6 months old. It shows up as usually minor upper respiratory infections, some noisy breathing and porph staining and if left will typically worsen and move deeper into the lungs eventually leading to pneumonia. The key with myco is to treat early on with the correct antibiotics. Many antibiotics don’t target the mcyo bacterium as it lacks a cell wall (which is what many antibiotics act on) as such solely Myco infections are best treated with a combination of baytril and doxycillin. In reality a rat showing respiratory symptoms is often triggered by a secondary infection which has lowered their immune system and allowed myco to take hold. In these cases it is often worth adding in a broad spectrum antibiotic such as Amoxycillin (or using it in the place of doxy). Generally you want a good long course of 3-4 weeks of whatever antibiotic you use. Even treated myco infections can lead to long term scarring of the lungs, so it is possible to treat a rat and them continue to be noisy even though the other symptoms are gone. In this case trial a spell off the antibiotics to see if the rat gets worse is worthwhile. In cases where the rat gets ill again it is worth trying different antibiotic combinations and adding in steroids. In some cases the myco may become chronic, in which case pulsing medication (e.g. 3 weeks on 3 weeks off) can be the only way to manage the long term condition. There are several other bacterium which can and do lead to respiratory infections in rats. Of these perhaps the most significant, though thankfully fairly rare, is bordetella. This is one of the bacterium responsible for kennel cough in dogs, and also regularly vaccinated against, as such it is significant as many rats share the house with dogs and the vets is also a shared space. In reality unless the dog is in regular close contact with you shortly before being with the rats (note; dogs shouldn’t be in actual physical contact with rats) or is in a shared room with the regularly and is actively shedding the virus (is unwell or has recently been vaccinated) then the risks of your rats picking it up is low. However when Bordetella hits rats it often hits them very hard and can kill. If you suspect your rats may have been affected get the whole group on antibiotics asap and make sure you keep them warm and well fed. There are several viruses that can cause issues in rats, however there are 2 main ones which are recognised as regularly impacting the rat fancy with sometimes devastating results. These are Sendai and SDAV. Both lead to respiratory type issues, however SDAV also often gives swollen neck glands and bulging eyes. These can vary in severity, much like the human Flu virus, ranging from causing minor symptoms across your group to causing deaths in a number of rats. The biggest issue with these viruses are the fact they are spread by airborne droplets and rats are infectious a significant time before they show symptoms. Some viruses can live for up to 3 days on certain surfaces and then go on to be picked up by rats. Whilst these do not have the constant presence that most bacterial infections do, there are regular outbreaks often starting from rodent farms (who supply pet shops) and travelling via places that rats and there owners congregate e.g. the vets, shows, house visits etc. There have even been cases reported of pet rats picking them up from wild rats who were able to break into the same airspace. There are always risks but with sensible precautions (such as quarantining – see later) this is manageable whilst still having contact with other rats and there owners. To identify if your rats have a virus you need to look at the group, viruses will spread across the entire group so whilst some may show few symptoms you would expect more than one rat to get ill at the same time. Viruses unfortunately do not respond to antibiotics, though it can trigger a secondary bacterial infection (so it can be worth putting them on something like baytril and amoxicillin or septrin). Typically treatment involves supporting the rats own immune system via easy to digest foods, keeping them warm and adding in an anti-inflammatory to help minimise the respiratory symptoms. In a severe outbreak you may not have time to treat the rats as susceptible rats can pass on within hours. If you suspect an outbreak the most important thing to do is to quarantine your rats from contact with any other rat owner (and take precautions before visiting another person’s rats yourself). You should also let anyone else who has had contact with you / your rats in the past 2-3 weeks know so they can do the same as well as monitor there rats. Without this viruses can be spread to many other homes and put more rats at risk. This is a particular type of bacterial infection, I’ve differentiated it as it can present different symptoms. The most commonly seen is caused by CK (corynebacterium kutscheri), this is an infection which may be endemic or is at least common in rats. It is opportunistic, hitting hard when a susceptible rat goes through a period of intense stress (such as an introduction, surgery etc.). Its characterised by lung consolidation and silent but heavy abdominal breathing (the pus involved is thick and cottage cheese like so does not sound wet). The chest often feels firmer and more solid, though this is something that’s hard to judge if you haven’t felt it before. The symptoms are very similar to a lung tumour. Treatment is difficult as it’s hard to penetrate consolidation, some people have seen success with Septrin or Amoxycillin, and some have found that the rat is better left to recover alone. There is a high chance that the rat won’t recover and will either pass on its own or need putting to sleep, once the lung consolidation has gone so far it can be difficult or impossible to reverse. One of the biggest things you can do to help avoid rats suffering from respiratory issues is to actually select rats from a line with minimal issues. Of course this is not always an option, and it would be wrong to ignore rescue rats in need because they might have respiratory problems. There are lots of methods which can help you minimise the risks or effects of respiratory infections. Humidity – Rats need higher humidity than us humans, this is particularly true when the weather is particularly dry or the central heating is on. You can increase this easily by leaving a bowl or water on a nearby radiator to evaporate, or looking into a cool air humidifier. This is especially worth doing if you have a rat with respiratory problems at the time, or the rats coat condition is indicating humidity is an issue. Humidity is also affected by the absorbency of the rats bedding. You do want nicely absorbent bedding to keep the urea and smell down in the cage, but too absorbent and you can exacerbate respiratory issues. A good balance is using a mixed or layered approach, with a highly absorbent bedding (say hemp or shavings) on the bottom and a less absorbent on (such as card) on top. Irritants – There are a number of substances that can irritate a rats sensitive respiratory system. Much like humans some rats are susceptible to particular chemicals or fragrances, however most rats have difficulty with anything strongly smelling. Phenols, such as those found in untreated soft wood beddings, are a particular example of this, avoid using untreated (heat treating removes a good amount of the phenols) or low quality examples in any rats, and consider a different substrate for any rats with longer term issues or weakness. Urea is another one, often it’s tempting to move rats onto something like fleece, which is very low absorbent but pretty, and very low dust. This can cause a build-up of urea which smells obvious even to our nose. Bare plastic shelves are also a killer for this. In short if you can smell it then your rats are going to be being affected by it. Dust is also the other most common irritant, the amount of dust varies a lot by type of bedding as well as even by batch of bedding. If it seems dusty or makes you sneeze then it’s not suitable for your rats.